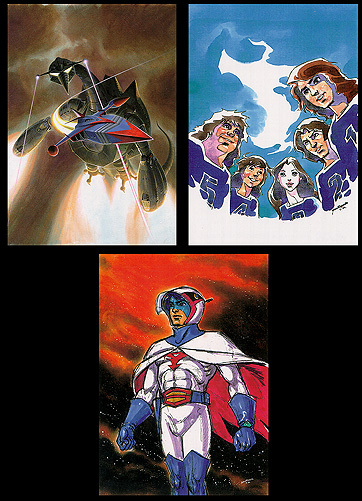 Information: These cards were part of an official four-card postcard set released by the Japanese group Tatsunoko Friend, There were three "Gatchaman "cards (pictured above) and one card from another Tatsunoko program called "Casshan." Unlike most of the later postcard issues, each of these four cards were individually packaged, yet they were only sold as sets. Later reprints of these cards were sold individually. Mitsuki Nakamura provided illustration for one (the God Phoenix and Turtle King), and Sadao Miyamoto provided the illustrations for the other two. These cards were printed with a matte finish. The God Phoenix and Turtle King postcard was also released in two other special alternate versions. The first alternate was printed with special metallic ink, and was offered only as a promotional item. To see it, click here. The other version was printed as part of a special reprint set with a glossy finish. The image on this version was slightly recropped. To see it, click here. Special sticker premiums were offered for buying the postcards, for pictures and information, click here.